Ninety days of open-Bible devotionals with Timothy Keller and Sam Allberry. Includes space for journaling. Timothy Keller and Sam Allberry sit alongside you as you open up the treasures of three enriching parts of God’s Word. These inspirational readings are presented in beautiful hardback format, complete with ribbon marker and space for journaling. Carefully-crafted questions, insightful explanations and helpful prompts to apply the Scriptures to your life will take you to the heart of God's word and then push God's word deep into your heart. 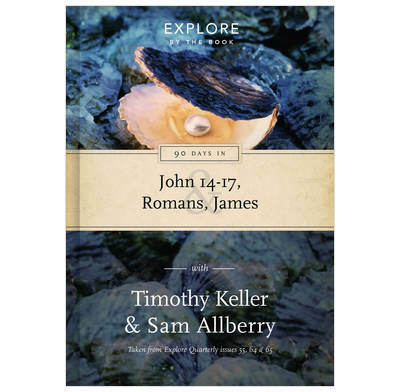 These 90 devotionals in John 14-17, Romans and James, taken from the Explore Quarterly range, are a great way to start reading the Bible. If you already spend time each day in God’s word, this book will take you deeper in to the riches of Scripture, drawing you closer to the Lord and gaining fresh appreciation for His love for us in Christ. Initially the reason for buying these books was to encourage a couple of teenagers I teach - however I have found I REALLY like reading them myself! I have never enjoyed daily Bible reading notes in the past; always preferring to just read the text however Im now a convert. This is an excellent book, helping the reader to really engage with and dig into the text in a way that is easy to understand and articulate clearly. I also found the application questions and room to write prayers and reflections superb. Excellent for a daily study. Delivery was on schedule. Received the book in very timely manner from The Good Book Company. The study book is as goid as I expected it would be. I have not completed the full book, a daily study mainly in John, but so far it's been a delight. Well worth getting. Thank you. Good layout, Great helpful daily reading alongside Gods word, very encourging and a blessing to use daily. Very concise and clear. The format really makes it easy to understand scripture. I highly recommend.